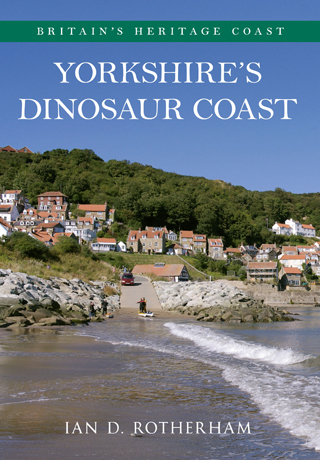 I was left deeply unsatisfied, and slightly confused, by reading Yorkshire’s Dinosaur Coast. Firstly, and most importantly, this is emphatically not a book about dinosaurs on the Yorkshire coast. In fact, save for a single generalised paragraph, the creatures get only the most passing of mentions. It does not enlighten the reader on the period these creatures walked the lands that would eventually become this region, the most common species, what they looked like when they were alive, their fossils or the stories of how they came to be discovered. I found this particularly remiss in the opening chapter on early history, where the author Ian D. Rotherham, discusses the lower, middle and upper Jurassic periods without once mentioning the subject. So then, is this simply a guide for visitors to the region? Again, no. At the very least I would expect such a book to have a map, showing the relationship of the places mentioned and, better still, street maps of the towns and villages discussed. There are no such maps, except for small reproductions of historic charts and a 1980’s postcard of the area. There is also a strange absence in the illustrations; if I were a new visitor to this locale, I would want to know what it looked like now, but there are no modern photographs whatsoever. I went to the effort of checking every image and the most recent (save for the 1980’s postcard) is 1974, whilst the vast majority are from the early 1900’s and older. Granted that many of the views have not changed substantially, but as a visitor I wouldn’t know this. The introduction claims that it is ‘Richly illustrated with […] photographs old and new’, but it is not. Who then is this meant to appeal to? I think the clue is in the subtitle of the Amberley Publishing series, of which this is part; Britain’s Heritage Coast. The large number of historic illustrations are well reproduced, offering a fascinating glimpse into the past, and the history of each location is discussed in some detail. So, if you are already familiar with the area and want to know a little more of its bygone times, this would be of interest. It would therefore be more accurately titled Yorkshire’s Heritage Coast. But even taking this readership as the original intent of the author, there are still anomalies: There are guidebook-style brief descriptions of the main towns and villages, and there is a chapter of current attractions. An extensive bibliography is given at the end, but fully half the quotes and extracts are from a single source; Gordon Holme, writing in the early 1900s. This feels like a book built around an excellent set of historic images, and definitely not one for anyone with an interest in dinosaurs.